The young children who died in a traffic pile-up on their way to Swaziland’s Reed Dance were packed into the back of a truck like cattle, photographs of the event reveal. The girls were forced to stand up in the back of an open truck cheek-by-jowl. There was no space to sit down or even to turn around. 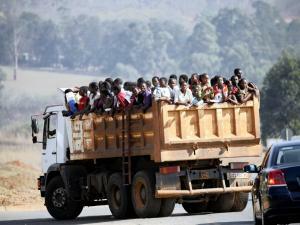 Photographs show that at least sixty children were squashed onto the back of a single truck. Many of the trucks that transported the girls were usually used to move building materials. Reuters news agency has released photographs of trucks used to transport girls to the Reed Dance. They are similar to the one that transported the children to their deaths. The crash happened on Friday (26 August 2015) evening. Media reports of the accident are inconsistent, but it is generally agreed that the children were thrown from the back of the truck when it was involved in a collision. Police reported that not all the girls died on the spot. The exact number of deaths in the incident is disputed. The Swazi Government said 13 people died; 10 maidens and three older people who were their supervisors. There is widespread disbelief in Swaziland that the death toll was so low. The Swaziland Solidarity Network, a prodemocracy group banned in Swaziland, citing the Swaziland Defence Force as a source, on Friday put the figure of deaths at 38. It later revised this figure to 65, citing medical officials as a source. The official figures include an 11-year-old girl and seven girls aged 16 or under. Media in Swaziland are heavily censored; the Swazi Observer, one of only two daily newspapers in the kingdom, is in effect owned by the King. The Media Institute of Southern Africa Swaziland chapter in a report on media freedom in Swaziland described the Observer newspapers as a ‘pure propaganda machine for the royal family’. International media reported that journalists in Swaziland were stopped from gathering information about the accident. The Reed Dance, which is also known as Umhlanga, is one of the main cultural events in Swaziland and it is strongly connected with the King. In Swaziland reporting negatively about the Reed Dance would be seen to be the same as criticizing the King. Welcome Dlamini, a senior reporter on the Swazi Observer, confirmed on his Twitter account that only ‘official statistics’ were used in compiling the report on the accident.